Purpose: To determine the efficacy and safety of treating predominantly hemorrhagic age-related macular degeneration (AMD) with transconjunctival sutureless vitrectomy (TSV), tissue plasminogen activator (tPA), sulphur hexafluoride (SF6), and intravitreal bevacizumab. Methods: Retrospective study, consecutive case series. Patients with acute hemorrhagic AMD treated with 25- or 23-gauge TSV, subretinal or intravitreal tPA, fluid-air-SF6 exchange and intravitreal injection of bevacizumab. All operations were performed within the first 5 days after the start of symptoms, which consisted of visual acuity (VA) loss and central scotoma. Results: Fifteen eyes from 15 patients were included. The patients’ mean age was 79.6 years, and the mean follow-up was 11.8 months. Five patients (33%) were receiving oral anticoagulant treatment. At baseline, the mean VA (logMAR values) was 1.5 (20/640 Snellen equivalent). At the last follow-up visit, the mean VA was 1.1 (20/250) (P < 0.0001; paired t-test). 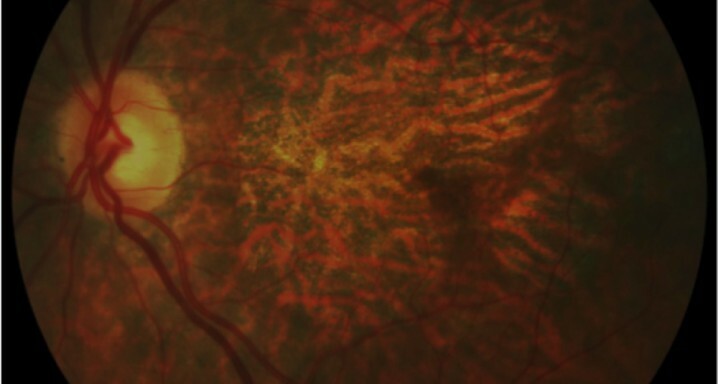 The submacular hemorrhage was successfully displaced in all the cases. Complications consisted of three cases of vitreous hemorrhage and a tear or the retinal pigment epithelium. Twelve cases (80%) did not require further treatment during the follow-up period. Conclusion: A surgical approach with 25- or 23-gauge TSV, tPA, SF6 and intravitreal bevacizumab is an efficacious and safe procedure in patients with hemorrhagic AMD. Early treatment is advisable for obtaining the optimal outcome.